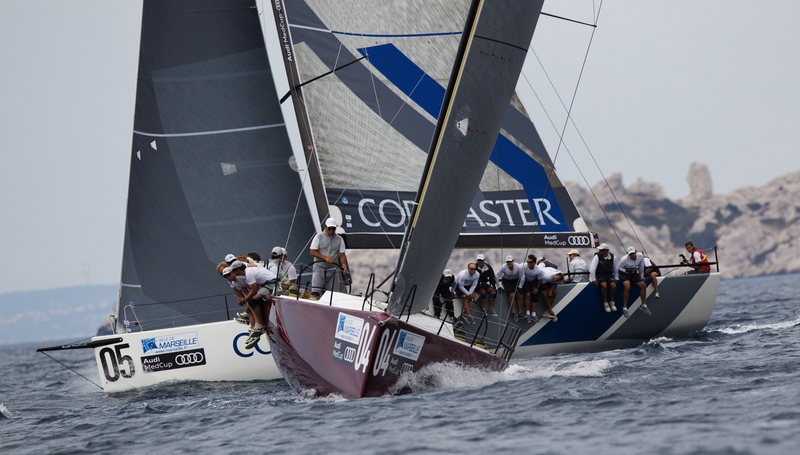 Gladiator have won Race 5, their second race in a row at the Marseille Trophy by dominating the windward leeward track. After a solid start Gladiator went hard to the right on the first upwind leg and rounded the windward turn ahead of Synergy. The moderate 9-15 knot southeasterly breeze was shifty with big changes in wind pressure. Gladiator's tactician Chris Main took every possible advantage to cross the line first, a solid 500 metres ahead of Container. Markus Wieser and the German crew got the best start but found themselves on the wrong side of the first big wind shift where they dropped into the very tightly fought pack. On the final run Hamish Pepper kept them in the strong wind pressure, while Quantum Racing went too far to the left, offshore, and due to this costly mistake dropped to third. Can Container Crush Quantum in Marseille?